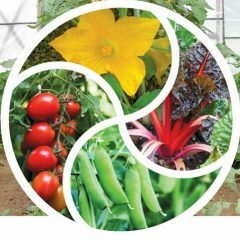 The June/July summer issue of Growing for Market is out, and with it my article about growing asparagus beans (yard-long beans). The photos in my article are from my friends at Southern Exposure Seed Exchange. Somehow we didn’t seem to have taken any pictures of our own asparagus beans. We usually grow a purple one, either Red Noodle or Purple Pod. We like them to provide some eye-catching visual variety among the greens and pale colors of other veggies in a mix, and the “short stick” shape adds another kind of difference. They are an easy crop to grow in warm weather. Once you have set up their required tall trellis, you can pretty much stand back and let them grow. They aren’t troubled by Mexican bean beetle or (in our experience) by diseases. They can tolerate some amount of drought. One short row can feed you all summer. We grow just about 34′ for 100 people, and get plenty. Having said that, I wouldn’t give up green beans for these – I don’t like the flavor as much as green beans, hence my suggestion to use them in mixed dishes.The mild flavor has been compared to a mix of bans, asparagus and mushrooms. Quite different from green beans. Chop the pods into one-inch pieces for cooking. Their real strength is as part of a stir-fry or a curry. Their unique flavor is brought out best by dry-frying in a hot wok with peanut oil, garlic and soy sauce. You can also stew them with tomato sauce; or boil, drain, and season with oil and lemon juice; or simmer in oil or butter with garlic. The pale green varieties are meatier and sweeter than the dark green ones, which have a stronger flavor. In soups, Chinese Red Noodle, with a small amount of vinegar added, produces a deep wine-red broth. Asparagus beans are a good source of vitamins A and C.
Although they are also known as Yard-long beans, you don’t actually want to let them grow that big, or they get puffy and tough. 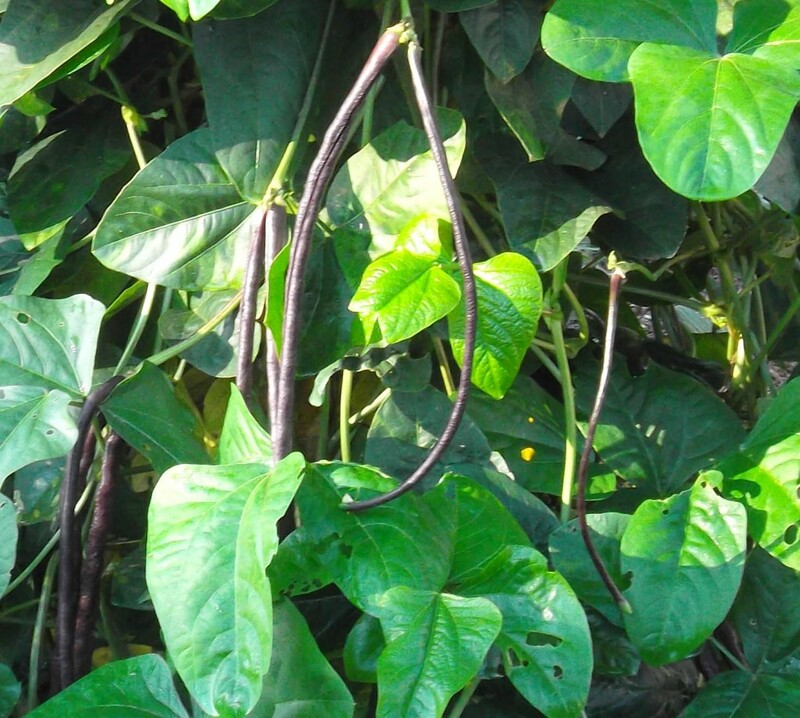 Harvest while they are still thinner than a pencil,about 10-15″ long, and before the beans develop. We pick ours three days a week, right through until the frost kills the vines. 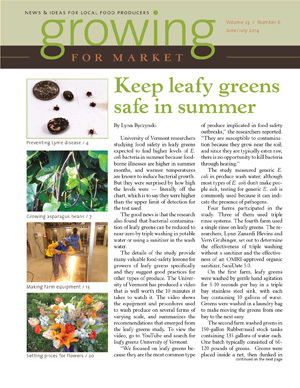 Also in this issue of Growing for Market is an article by the editor, Lynn Byczynski, about food safety of leafy greens in summer. Triple rinsing your greens in potable water, and spinning out the water before cooking (or eating raw), will greatly reduce the likelihood that you let any nasty micro-organisms into your lunch. Brett Groshsgal has written a good article about Lyme Disease, which we farmers risk more than the average population. He describes the symptoms (never mind looking for that elusive bulls-eye rash, which 40% of adults and a higher percentage of children never get), and urges prompt treatment with antibiotics. He says bluntly that holistic or alternative treatment methods don’t work, so waste no time getting the antibiotics. Then you can get on with your life. Etienne Goyer writes about a growers’ convention in Quebec to build DIY raised bed shapers, cultivators and finishers. This is part of the ADABio Autoconstruction association mission to empower farmers with the skills to build their own machinery. I had looked at their website, but struggled with my high school French, so I am very happy to have this explained in English! Lastly, Gretel Adams writes about how to set prices for cut flowers, for retail, wholesale, weddings and bouquets. My other main news is that a variation on my blogposts about biodegradeable plastic mulches has just been published on Mother Earth News’ Organic Gardening blog.